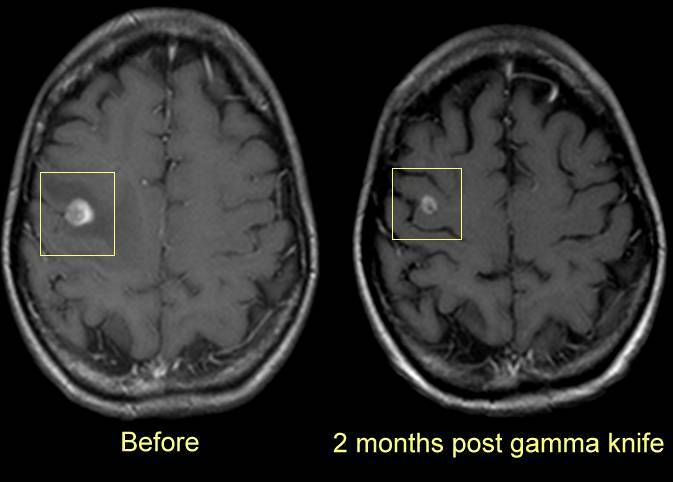 Patients who are initially treated with whole brain radiation can be treated with radiosurgery when they relapse (see study.) 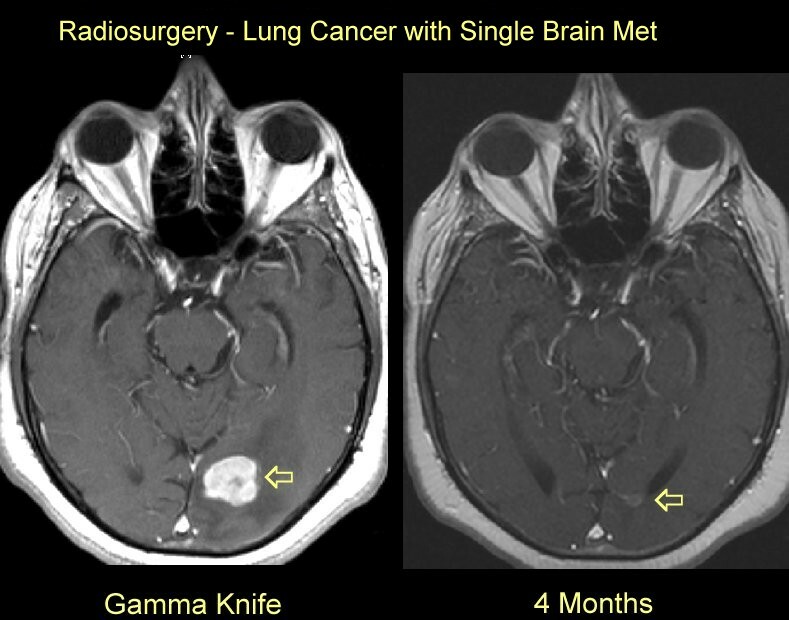 Also the RTOG study showed the patients who clearly benefit from adding radiosurgery to whole brain radiation are those with single mets and otherwise favorable medical conditions: (see below) the Pitt group had some long term survivors with other sites of metastases (see study.) 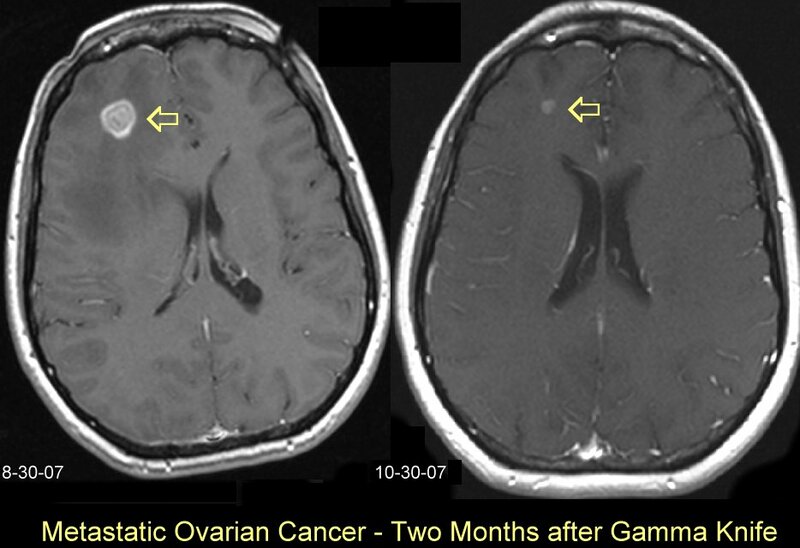 Margins around the tumor may extend out 1mm (see study). 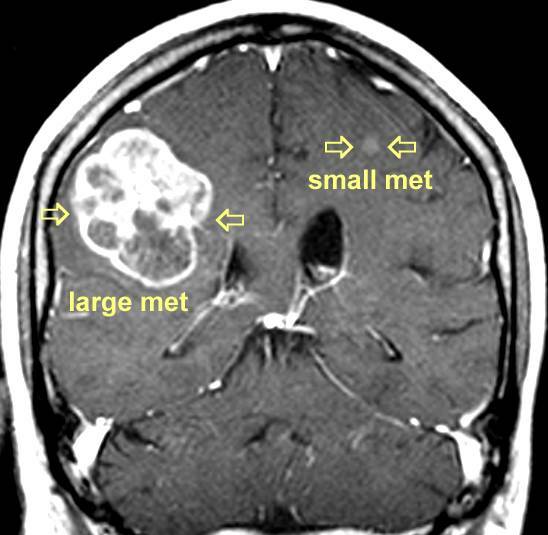 In patients who have surgery to resect a met, postOp radiosurgery to the tumor bed may be a good option and require a 2mm margin (go here). 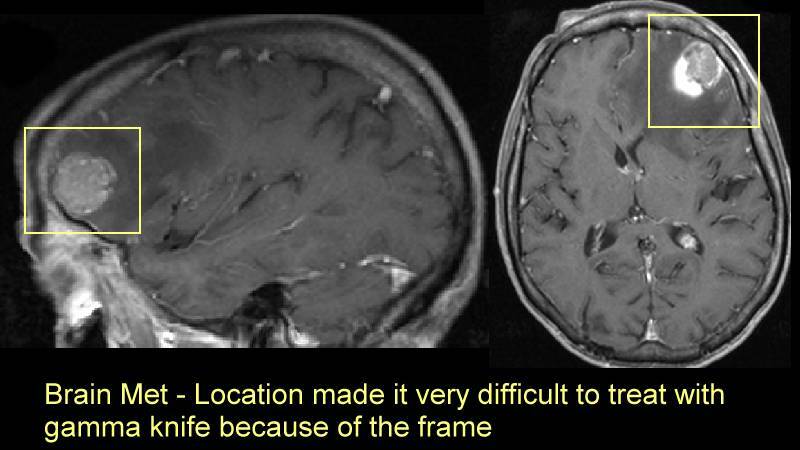 There is a controversy about patients with multiple brain metastases as to radiosurgery alone or combined with whole brain irradiation (see here, here, here and here). 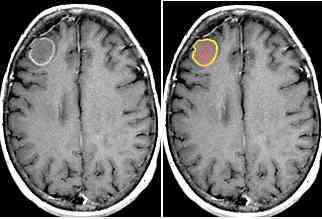 Size is important, radiosurgery is best of the tumor is less than 3-4 cm (see here and here). 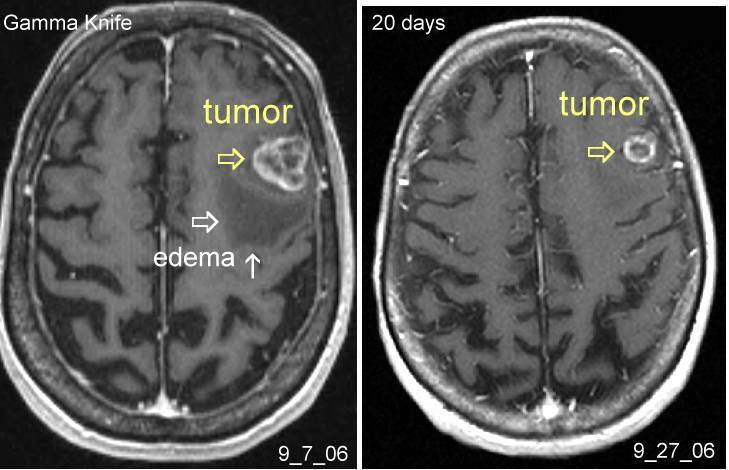 Location is important, the tumor has to be moved to the center of the helmet so if the tumor is at the edge of the brain it may be hard with a frame system to target the lesion (go here.) 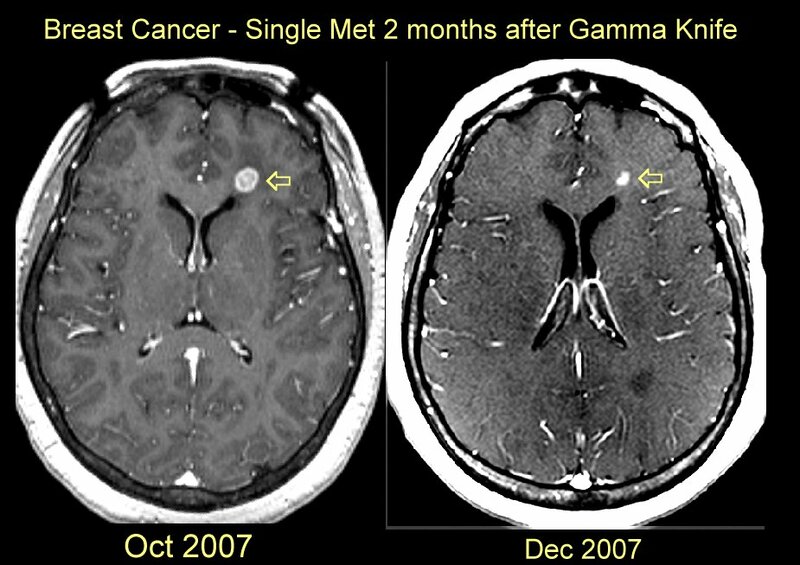 With the frame and helmet there are limits if the tumor is too far lateral (x axis) the opposite side of the head or frame will collide with the side of the helmet (referred to as a collision) if the tumor is too low (z axis) the top of the head may collide and if the tumor is too close to the front (Y axis) then the back of the head will collide. 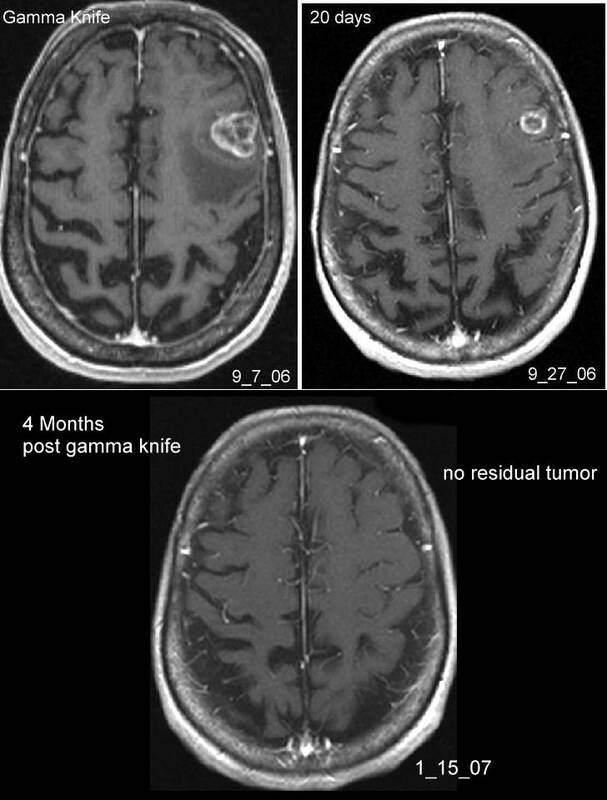 Frameless radiosurgery techniques do not have this limitation. 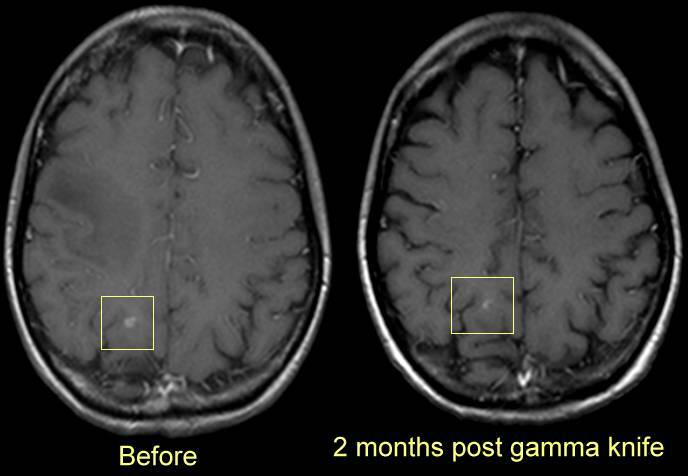 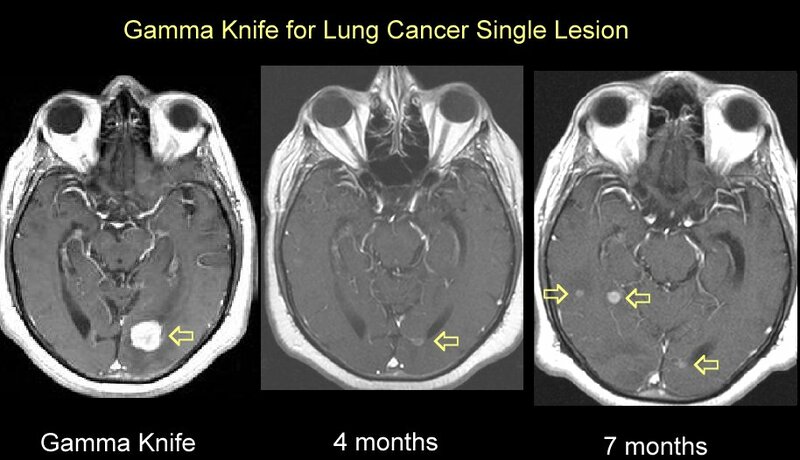 Follow-up MRI's usually every two months will demonstrate response: gamma knife response after 3 weeks and same case after 4 months, gamma knife mets after two months here and here, another case at 4 months here. 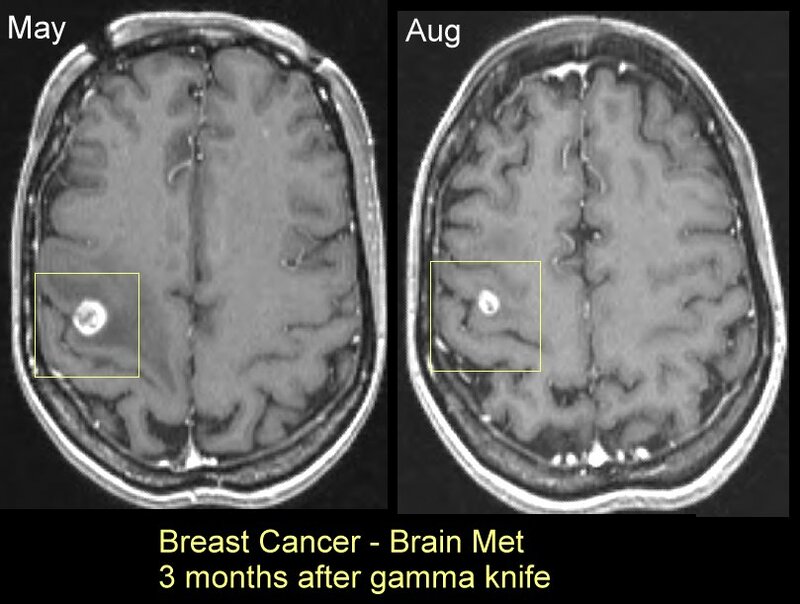 Breast mets at two and three month here and here. 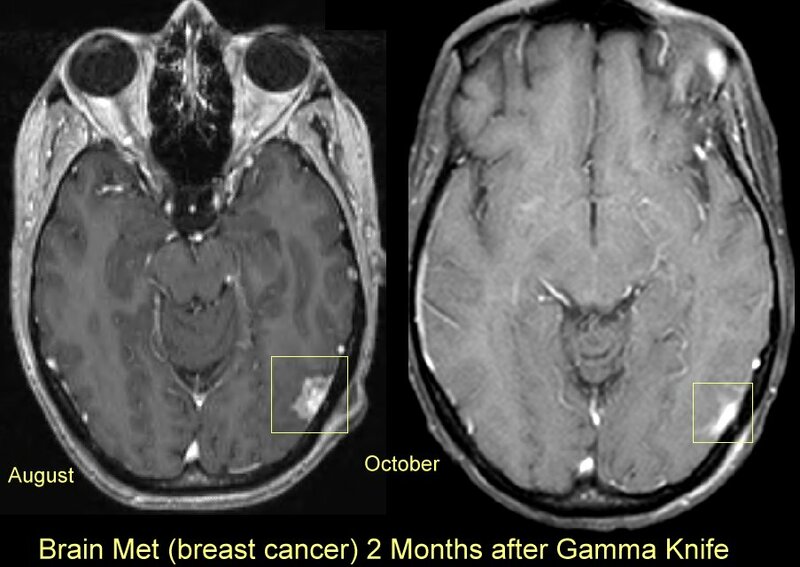 Breast cancer single met at 2 months here. 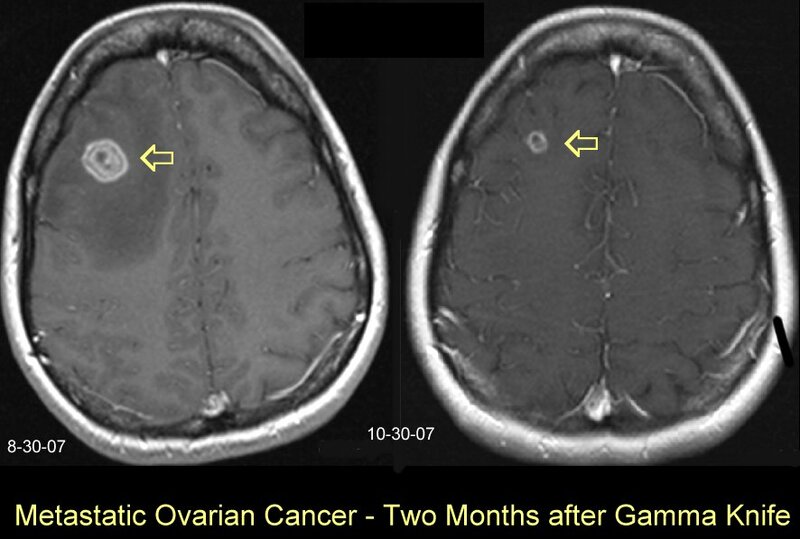 Ovary cancer mets at two months here and here. 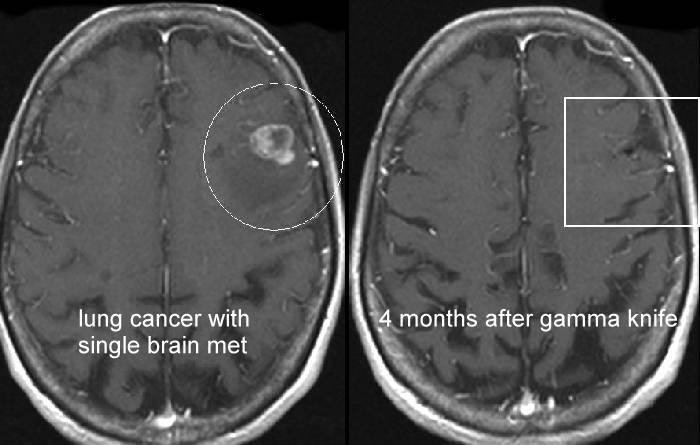 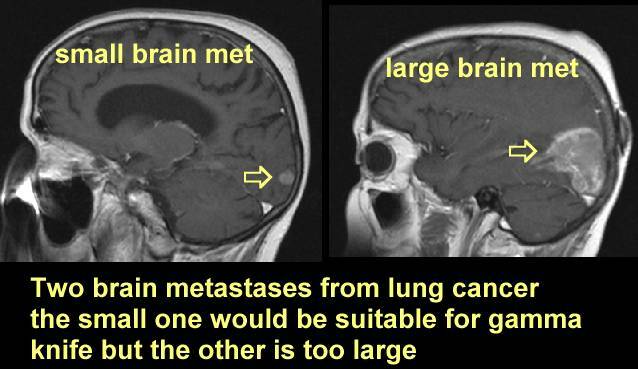 A classic problem with brain mets is the development of new lesions (see here) For more images of treated brain metastases go here.